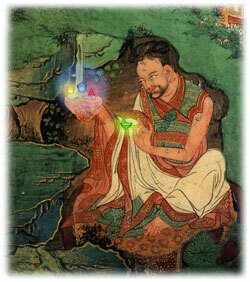 Tibetan Energy Healing/The world's most powerful and accurate energy healing system, using the five elements of Earth, Water, Fire, Air and Space, according to the ancient Tibetan traditions of tantra and Vajrayana, collected, synthesized and optimized for healing in the post-technological world. All the great medical systems of the past—of India, China, Greece, Rome, the Middle East, European Herbalism—naturally took the great truth of the 5 element energy healing as the basis of diagnosis and treatment. Particularly, the elemental secrets of ancient India, Persia and Mesopotamia were refined and perfected in the isolated valleys and snowy ranges of Tibet over a thousand year period. And while this precious knowledge faded from Western culture, the wisdom of the 5 Ways of Power and the inner meaning of the 5 elements was carefully preserved and transmitted. Now these practical teachings on healing body, mind and spirit are once again available to the modern world in a highly accessible form. This is the ultimate system for both self-healing and healing others. And while it can be used as a stand-alone approach, it also greatly increases the impact of Reiki, Pranic Healing, Qi Gong, Shamanic healing and literally scores of other methods of working with the energies of body, mind and spirit. The fundamental basis of our physical form is the five elemental forces, and Tibetan energy healing works directly with these. From these underlying principles arises our vitality, our health and all our illnesses. Each element contributes to our health with its dynamic characteristics: the stability of Earth, the suppleness of Water, the mobility of Air, the warmth of Fire and the encompassing nature of Space. Their balance is the basis of health, longevity, immunity and vital strength on every level. The underlying basis of all illness is imbalances and distortions of the basic 5 Elements. The endless variety of diseases can all be helped by using a non-invasive approach that reinfuses the body and mind with the original strength and power of the elements. Using visualization, meditation and mantra, the original pattern of health and vitality can be reinstated. The template of the 5 elements is the basis of all mental phenomena, all emotions, all joy and all suffering. This fact makes it possible to understand the most intricate and subtle aspects of human motivation, actions and inner experience. It also allows the most direct and powerful transformation of human emotion, reinstating the original structure and purity of mind’s essence. While all joy and positive qualities, such as fearlessness, compassion, love and strength arise from the mind’s elemental Power, all suffering, lack of confidence, inner vulnerability and depression stem from elemental Loss. And all negative motives, actions and characteristics arise from the distorted elemental Shadows. Power, Loss and Shadow are the basis of elemental psychology, and the key to our possibility for genuine inner freedom and wholeness. Contact Us[http://tibetanenergyhealing.com/contact-us/]Copyright © 2010 Tibetan Energy Healing. All Rights Reserved.